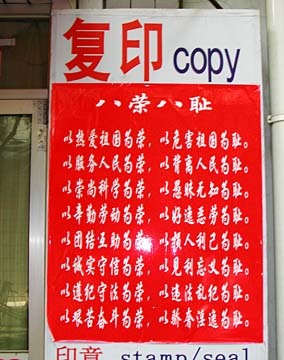 A poster listing China President Hu Jintao's "Eight Dos and Eight Dont's" of proper behavior hangs in a Beijing store. Beijing's political lexicon is populated with a wide variety of political slogans and mottos (biaoyu kouhao) typical of a particular era and leadership style. Slogans and mottos of this sort are quick and easy to read and can be found everywhere: on signboards, bulletin boards, newspapers and television. Reminiscent of Orwell's "newspeak," such language might be called "Beijing Speak." On both sides of the huge portrait of Mao Zedong suspended over the entrance to Beijing's Forbidden City, where Mao proclaimed the establishment of the People's Republic of China in 1949, are two prominent slogans of the time: "Long Live the People's Republic of China" (Zhonghua renmin gongheguo wansui), and "Long Live the Great Unity of People Throughout the World" (Shijie renmin da tuanjie wansui). In 1952, the "Three antis (sanfan) focused on eliminating corruption, stifling bureaucracy and waste; and the "Five Antis" (wufan) targeted bribery, tax evasion, theft of state property and economic information and shoddy workmanship. Starting in 1966, the Cultural Revolution spawned a wide variety of new political slogans. The best known was "To Rebel is Justified" (Zao fan you li), which sought to justify attacks on the Chinese Communist Party and all forms of authority, even including parents. Beginning in 1977, Deng Xiaoping eagerly set China on a new economic path, free of the socialist blinders that had held China's economy back. "Seek truth from facts" (Shishi qiu shi) encouraged the Chinese public to welcome economic growth, even if it meant departing from orthodox Marxist notions of economic development and adopting some aspects of capitalism. "White cat, black cat as long as it catches the mouse is what makes a good cat" (buguan heimao baimao neng zhuadao laoshu jiushi haomao). In other words, it is the end result, not the means that really matters. Jiang Zemin, 80, served as president of China, general secretary of the Chinese Communist Party (CCP) and chairman of the Central Military Commission from 1993 to 2004. During his tenure, China experienced phenomenal 8 percent annual growth in its gross domestic product aggressively shepherded by Premier Zhu Rongji, whom many dubbed "China's economics czar." With Jiang and Zhu at the helm, China's economy took on global significance and was finally admitted to the World Trade Organization and selected as the 2008 Summer Olympics site. Clearly, Jiang realized the growing power of the global economy and wanted to ensure a permanent position in it for China. "Reviewing the course of struggle and the basic experience over the past 80 years and looking ahead to the arduous tasks and bright future in the new century, our party should continue to stand in the forefront of the times and lead the people in marching toward victory. In a word, the party must always represent the requirements of the development of China's advanced productive forces, the orientation of the development of China's advanced culture, and the fundamental interests of the overwhelming majority of the people in China." Interpretations vary as to the exact meaning of individual parts of the Three Represents. What is clear is that Jiang used his theory to justify entry of highly successful, private business people into the party to help China's economy keep growing. National leaders in any system ultimately want to create a legacy; Jiang is no exception. Despite grumbling within the party about the focus on businessmen in view of China's widening income gap, Jiang's theory was incorporated into the CCP and Chinese state constitutions. Moreover, Jiang attempted to use his theory to promote himself as an equal to Mao and Deng, which in most Chinese and foreign analysts' eyes was a stretch. After all, Mao created the New China, and Deng put it on the road to economic prosperity. Jiang's leadership is not without merit; however, he advanced Deng's vision rather than having created any fundamental change in direction. Mao and Deng are held in high esteem; Jiang gets mixed reviews. While Jiang might be considered more of a coastal elitist, his successor, President Hu Jintao, 64, is identified with inland China and the "laobaixing" (everyday people). Hu and Premier Wen Jiabao came to power in March 2003 in the wake of Jiang's and Zhu's phenomenal economic growth and the resulting socioeconomic problems that came with it. For example, growing economic gaps between the haves and have nots throughout Chinese society; regional economic disparity between the coastal and inland provinces; high unemployment and underemployment abetted by economic privatization, a faltering health care system; and rapacious corruption at all levels. At the National Peoples Congress in March, Hu and Wen put forth proposals to address economic problems and to improve the availability of health services. Moreover, they have sought to slow down the overheating economy and to curb inflation. Western countries are not free of corruption but keep it under control through a free press, independent judiciary, fair elections, the presence of countervailing political forces and so forth. In the main, China lacks these conventions. Given the omnipotent power of the CCP, it is generally accepted that corruption cannot exist without the connivance of the party or individual party members. Corruption has a definite corrosive effect on political stability and popular credibility. In other words, it can channel the benefits of economic progress to those with a special connection and stymie economic growth, the only reason that many continue to support the party. China has a history of key political leaders seeking to prolong their influence as long as possible. In 2004, Jiang resigned the chairmanship of the Central Military Commission. Having earlier resigned his positions as general secretary of the CCP and president of the People's Republic of China, Jiang was lauded for quietly and peacefully going into full retirement; however, conjecture ensued that Hu's party supporters pressured Jiang to resign from the CMC long before his term was to expire in 2007. In August of this year, Jiang resurfaced on the national stage when two books that he authored went on sale. One book is chock-full of pictures taken during his many foreign visits while president; the other is a three-volume set "Selected Works of Jiang Zemin." Given the influence of the "Shanghai Clique," a group of leaders that Jiang appointed to key positions before retiring, it is noteworthy that Jiang should reappear at this time. There is an ongoing struggle for influence between Jiang and Hu. Jiang wanted Zeng Qinghong, rather than Hu, to have succeeded him. Moreover, Jiang's Shanghai Clique and Hu's loyalists have policy differences. Although Hu's and Wen's term runs until 2012, Hu is obviously concerned that Jiang might be starting to hatch a scheme to influence the selection of Shanghai Clique members as the next generation of leadership at the upcoming 17th Communist Party Congress to be held later this year. The consequences for Hu would be difficulty in consolidating his leadership. Hu has been acting like a velvet hammer. His recent speeches have played up Jiang's Three Represents in an obvious attempt to appease him. On the other hand, Chen Liangyu, first secretary of the Shanghai CPC and a leading Shanghai Clique member, was arrested and removed from power on Sept. 25. Chen allegedly peddled his influence, gave special favors to family members, protected staff involved in illegal activities and siphoned off money from Shanghai's social security fund. It is unfortunate that when a high-level Chinese leader is arrested and/or removed from power that political reasons can be the motivating factor. Thus it is not surprising the BBC reported that many China analysts have concluded the real reason for Chen's demise is Hu's attempt to strengthen his position before the party congress. Bill Sharp is adjunct professor of East Asian International Relations at Hawaii Pacific University. He writes a monthly commentary about events in Asia for the Star-Bulletin.